From the mad Malachite throne in Rauxes to the bejeweled city of Chendl in Furyondy, the Flanaess is at war ! In the east, Overking Ivid V thirsts for conquest. Vatun, Great God of the North, meanwhile unites the barbarians and Fists into a fearsome sorce. Not to be outdone, the dread Iuz masses humanoids and fiends in the northwest. And the Scarlet Brotherhood in the south hangs over all the Flanaess, pulling the strings of war like a mad puppeteer. The Adventurer’s Book from this board game details the official history of the Greyhawk Wars (582-584 CY), giving much useful information not found in later works. It also makes clear the timing of events during the Wars. Take command of the armies yourself and change the dark course of history ! 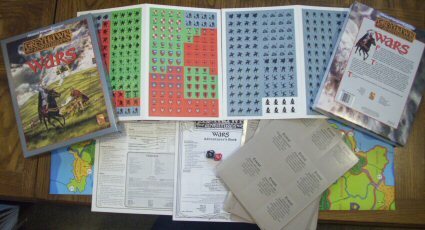 Between two and six players can battle, deciding the Flanaess’s fate in diplomacy and war, and leading armies and heroes across two full-color maps. Muster your armies from over 300 counters, ranging from light infantry to dragons — with your favorite demihumans and monsters as well ! With over 150 cards, you can search for treasure or mercenaries and receive the gods’ blessing (or curse) through special events. When the battle come — the times that try the souls of all — you’ll want your armies backed with the wisdom contained in the 32-page history of the actual war. The boxed set also includes an easy-to-read 8-page book of rules, with optional advanced rules for hard-core wargamers. The Flanaess awaits an heroic deliverer — or an oppressive overlord ! Which will you be ? 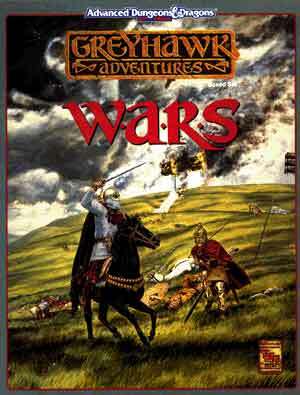 Voici le 15e fichier qui compile les meilleurs articles postés sur le forum Greyhawk d’AOL (Juillet - Aout 1996). Un petit frère (un fork amical) à Oerth Journal, vient tout juste d’être publié. Il contient plus de 150 pages, essentiellement d’aventures, rédigées par les amateurs et les spécialistes du monde de Greyhawk. Le numéro 26 de ce fanzine, qui existe depuis 1998, a été publié en octobre 2011. Le thème de ce numéro est "Au delà des Frontières du Flanesse"
Vous trouverez dans la Grande Bibliothèque le résumé de tous les numéros du Oerth Journal, et un lien vers le site qui les héberge actuellement. Août 2013 - Canonfire! Chronicles Now Available! Décembre 2011 - The NEW Oerth Journal!